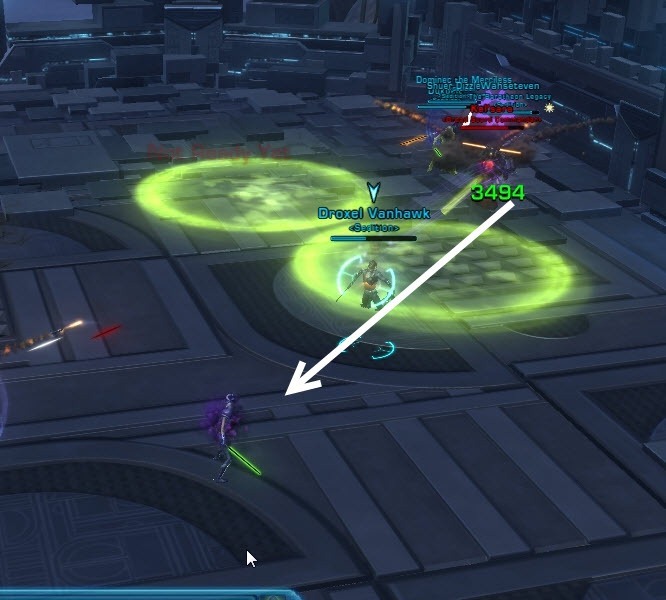 This is the boss strat for Ciphas, Heirad, and Kel’Sara, the second boss in SWTOR Terror from Beyond Operation in Patch 1.4. Included are strats for storymode and hardmode. Video for hardmode will be coming shortly. Phase 1 : Heirad casts Surging Chains and becomes immune to damage Source of immunity is from Ciphas, who needs to be damaged and then interrupted (Ciphas is immune to interrupts until you burn through his barrier). Tank Swap (all phases) Both Ciphas and Kel’sara put stacking debuffs on their tanks that deals more damage with more stacks. Swap tanks at 5 stacks. Ciphas has a cleave so becareful when swapping around. 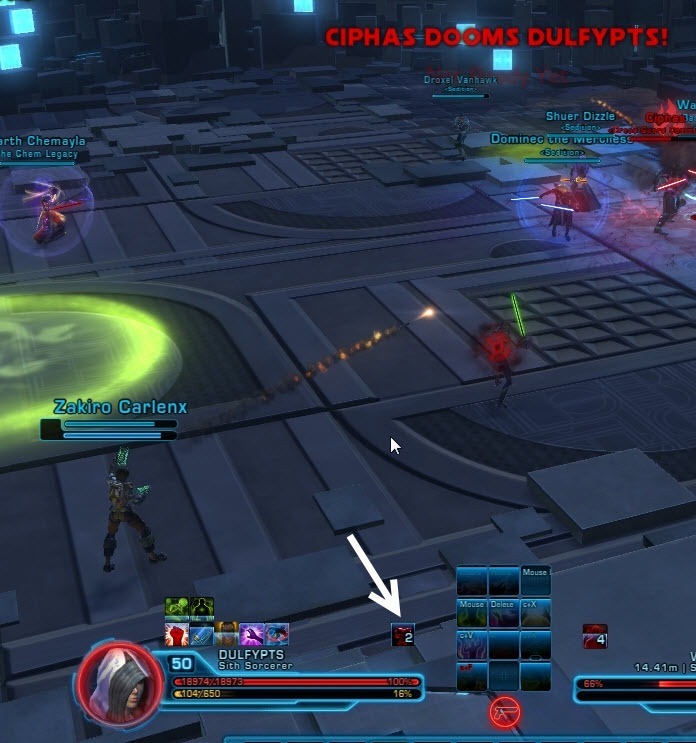 Phase 2: Ciphas dooms players Person with doom need to run into 2 green circles to clear the debuff or they get one shot. Phase 2: Green circles Green circles are spawned on top of players, move away from them as soon as they spawn and don’t run through them unless you have Doom. Phase 3: Death mark Person marked need to run away from Kel’sara, use speed boosts or sorc/sage pulls to help marked player escape. 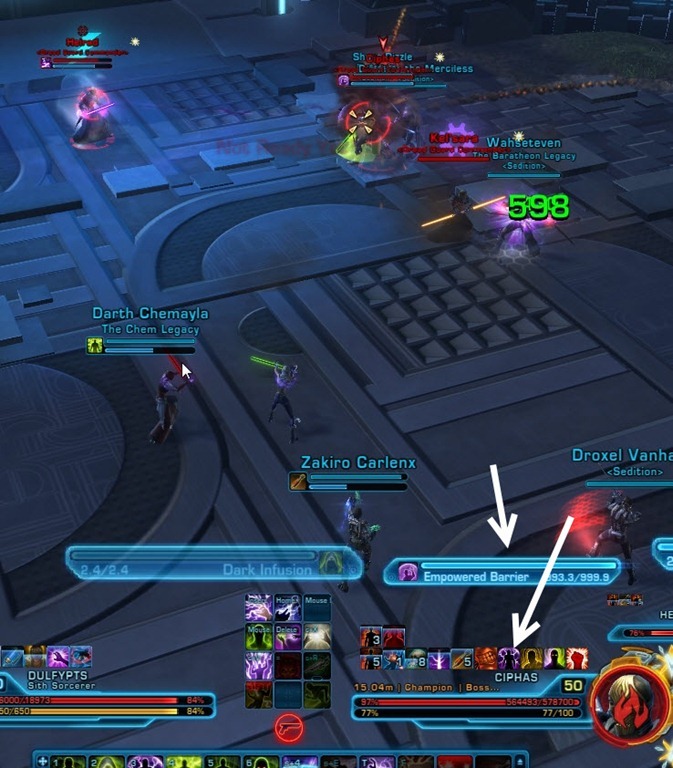 All bosses are immune to CC and have the buff Death Covenant (When the target dies, any Dread Guard Commander in the area are fully healed). This is to prevent you from killing all bosses at the same time as killing one will fully heal the others. In addition, every boss have uniques buffs. Ciphas – Dark Pact – As Ciphas takes damage, Heirad occasionally becomes more and more empowered with Overcharge, significantly increasing the damage he deals. Kel’sara – Dark Bond – As Kel’sara takes damage, Ciphas occasionally becomes more and more empowered with Blood Vengeance, significantly increasing the damage he deals. Heirad, in particular, have Taunt Immunity and cannot be taunted. He will instead target random players and damage them with Force Lightning. Heirad have taunt immunity and damaging him heals Kel’sara, which doesn’t matter since Kel’sara will be fully healed once Heirad dies anyways. Damaging Ciphas will buff Heirad’s damage but if Heirad is already dead then it doesn’t matter. 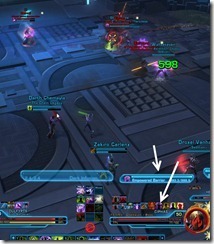 Killing each boss will introducing new abilities into the remaining bosses. Heirad will randomly shoot Force Lightning at random players in the raid. This attack deals 700-1400 damage per tick and ticks for 3-4 ticks. Two tanks will tank Kel’sara and Ciphas and do a tank swap on when the debuffs on the tanks reaches 5 (5 is an arbitrary number, you can swap earlier or later than 5). After a few lighting attacks, you will see the message – Heirad Begins to Cast Surging Chain! Ciphas will hop over and casts Empowered Barrier on Heirad to make him immune to damage. 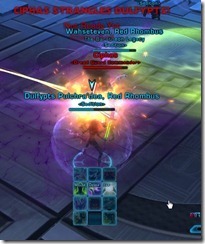 You now must damage Ciphas so break his shield bubble and the interrupt his Empowered Barrier ability. The symbol for his shield bubble is the same as the sorc/sage bubble. Surging Chain hits for 2.5-3.5k. Rest of this phase is basically Heirad switching back and forth between Force Lighting and Surging Chain. 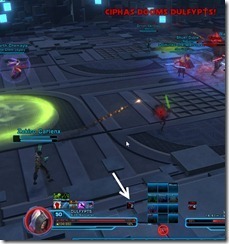 Killing Heirad bring new mechanics into phase 2 for Ciphas (Kel’sara is unchanged). 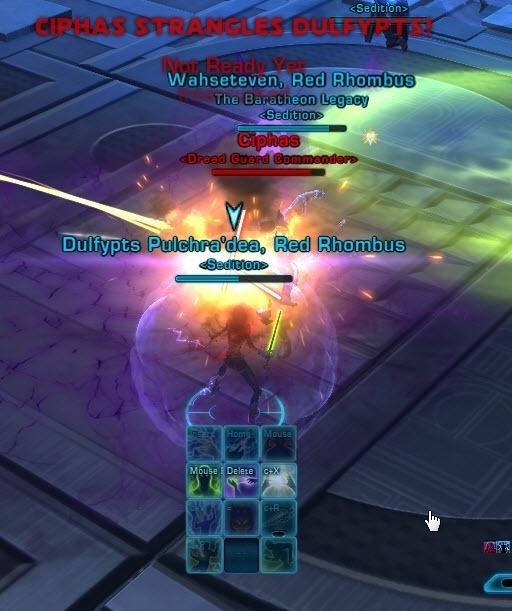 You still need to tank swap between Ciphas and Kel’sara while burning down Ciphas. Ciphas will doom random players in the raid (doesn’t seem to target tanks). 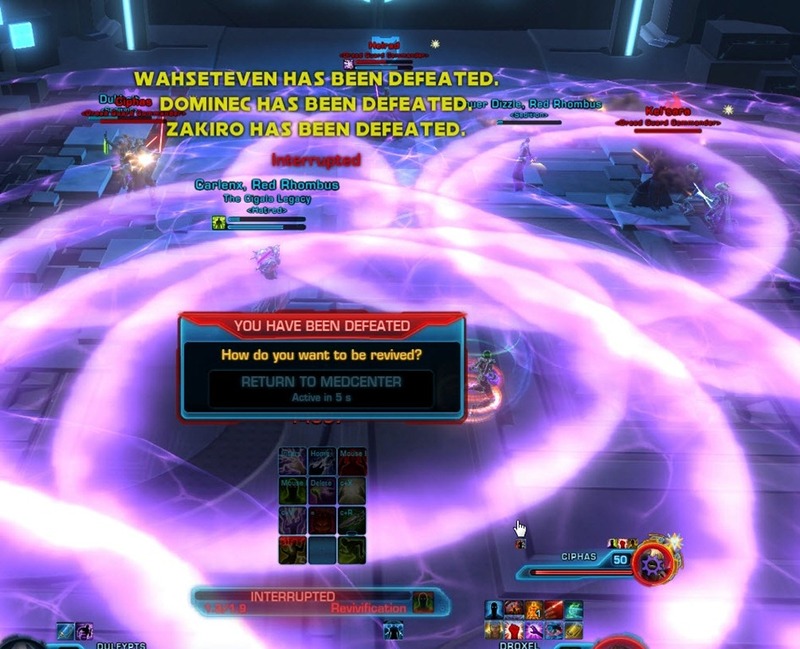 You will get a red text on screen when this happens. When someone is Doomed, they get 2 stacks of the Doom debuff on them (2 stacks in storymode, 3 stacks in hardmode) and will need to run into 2 green circles on the ground to clear it. Green circles on the ground are called Expiatory Motes and are spawned on top of players. You get a warning for when the circle will spawn as your character will get green mist shortly before the circle appears. Move as soon as you see the green mist. You have about 10 seconds to clear Doom by running through the green circles, each time you run through a circle you will take about 2.2 k damage. Do not run through the circles if you don’t have Doom as you will take unnecessary damage and make the circle disappear. Failure to clear Doom in a timely manner will hit you for 15246755 damage. Killing Ciphas will introduce two new mechanics for Kel’sara. Withering Terror, a 24 second DoT on random raid members that ticks for 1486 damage every 3 seconds. ~14 kdamage in total. Cannot be cleansed and must be healed through. Phase 1: Heirad Begins to channel Lighting Field Everyone need to be assigned to a location in the room that they ran to during this phase. Goal here is to spread out as much as possible while keeping healers near tanks to top them off. 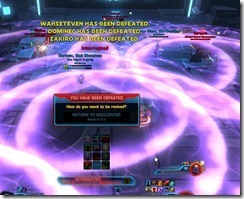 The raid will take massive damage that can be lessened if everyone is spread out. This fight is very healing intensive on hardmode, especially phase 1. You will want to get through phase 1 as quick as possible and get only one Lighting Field. 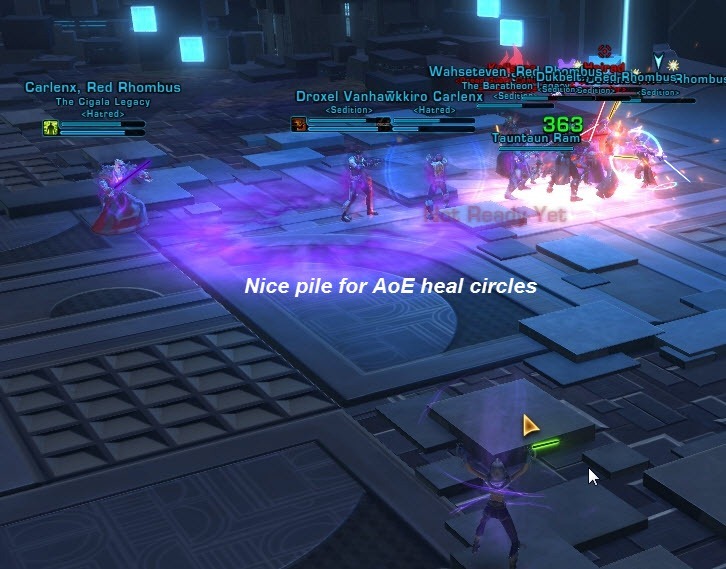 Heirad has some nasty tricks up in his sleeves for phase 1 on hardmode. He will start to channel Lighting Field shortly after his Surging Chain immunity phase. This is a raid wide AoE that ticks for 1144 per tick for 7 ticks and then explodes, dealing anywhere from 6.6k –7.5k damage if you are all spread out to instant one shot if you are all clustered together. So, spread out as much as you can! The circles in the picture below will give you a rough idea of how much you need to spread out. Generally if you are <50% HP when the lighting Field started, there is a very good chance you won’t survive it. Use defensive cooldowns/medpacks if you need. Everyone need to be assigned a spot in the room that they run to for this phase so people don’t run into each other and get each other killed. Tanks and healers should be near each other so tanks can be topped off after this phase to tank Ciphase and Kel’sara. 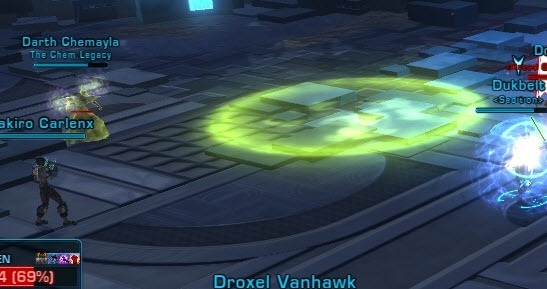 Ranged DPS should be assigned spots near the bosses they can they keep DPS during the Lighting Field phase to help meet enrage timer. 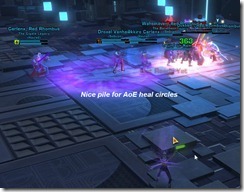 After the Lighting Field phase, it is a good idea to have everyone stack in the same pile (make sure you face Ciphas away from the raid due to his cleave) so healers can drop healing circles and heal everyone up at the same time. Ideally, you will want to have only one Lighting Field in Phase 1 or otherwise you might have trouble with the enrage timer. In addition to the strangle, Doom is now 3 stacks on hardmode. 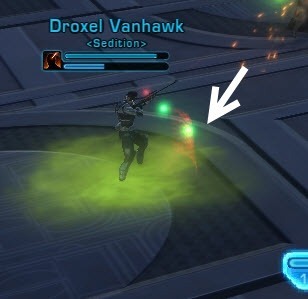 Watch your debuff bar carefully as sometimes running through a green circle may not clear it. Kel’sara gains two additional mechanics in hardmode. As it can be hard to see due to the intensive healing on this phase, tanks will ideally call out for healers to not heal them. You will also want to make sure that tanks are topped off before the Force Leech starts so that they have some leeway. Force leech comes about 10 seconds after Ciphas is killed and comes after every Death Mark phase. Three Dread Guard Legionaires will spawn in about the middle of the room (might be more on 16m). The one in particular you have to kill ASAP is the one on the right (if you are facing the door behind the boss). He will cast Mass Affliction, which is a raidwide curable DOT that ticks for 1190 every second. That is a lot of raid damage and can be quite taxing for your healers so you will want to kill that particular guard ASAP. The rest of the Dread Guard Legionnaires are melee and will use Smash which deals for ~2.5k damage. They have only ~7k HP on 8m so they should be killed as soon as they spawn. These Legionnaires are usually summoned a few seconds after Kel’sara marks someone for death so you can expect quite a few waves of them. Withering Terror, the uncurable DoT from Kel’sara, hits for 2.4k every 3 seconds on hardmode so you will want to make sure to top off whoever has the DoT. this has nothing to do with anything but what server are you on?